I have represented injured workers for over 20 years in cases before the Georgia State Board of Workers’ Compensation. The Georgia workers’ compensation system can be frustrating and slow. My role as your advocate is to maximize your medical benefits, obtain and protect your weekly wage benefits and to work towards a fair settlement of your claim. In this blog, I respond to questions from anyone who is interested in Georgia workers’ compensation laws. I also try to alert you about changes in the law and strategies to improve your results. I will also tell you about tactics used by insurance companies to deny claims and reduce payout of benefits. For the first 5 years of my career I worked for a large insurance defense firm so I saw firsthand how insurance companies try to minimize what they have to pay. Workers’ compensation law is one of the most adversarial areas of law that exists. Every day I go into battle on behalf of my clients. 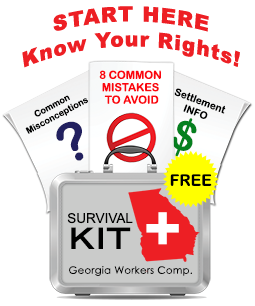 Please use the information on this blog as a resource to learn more about the Georgia workers’ comp laws. You can connect with me on Google+. Please click here to email me or feel free to call me at 770-351-0801.